With thanks to Denis Pickles for sending the scan. "This unidentified lady in her chauffeur-driver automobile epitomises an age when motoring was an elegant privilege. 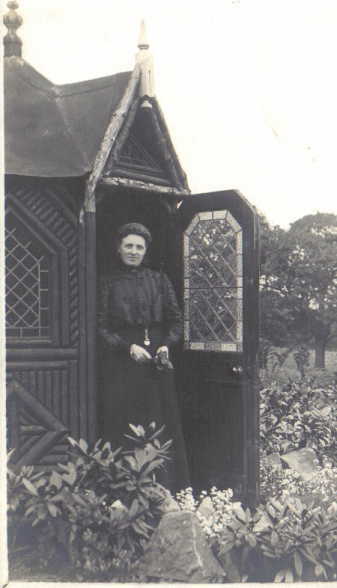 She was photographed outside one of Yorkshire's latter-day country houses, Sutton Hall. Described in its heyday as 'one of the most palatial residences in Craven', Sutton Hall was built in the 1890s for John William Hartley, the reclusive bachelor owner of Greenroyd Mills. At the time of his death in 1909, he was said to own 'practically all the houses in Sutton, and also the larger part of the farms on the hillside hear the village'. But his magnificent residence, which was never completely furnished, was destined for a relatively short life. In 1934 Keighley building contractor Ernest Turner was proposing to divide it into flats. He gave 6½ acres of adjoining woodland to Sutton Parish Council, but the rest of the estate was developed into what he called 'a kind of garden city - the first and the finest in this neighbourhood', a project which involved the demolition of Sutton Hall itself a few years later. The photograph was supplied by Mr Graham Hall of Micklethwaite." Going by the car registration alone (AK 2784), I would estimate that the vehicle was new in 1907 or 1908. Registration numbers were assigned roughly in ascending order, and Ezra Laycock's double-decker bus (AK 343) was new in 1906, while his white Maudslay charabanc (AK 3113) was new in circa 1908. The car appears to be a Wolseley 12/16 Type A4 Touring Phaeton. The date of 1912 would be about right as prior to this date the vehicle had solid spoke wheels. The windscreen was in two parts and has been folded down, most likely for the benefit of the photograph. The vehicle must have drawn quite a crowd as it travelled down the High Street, unlike today when nearly every household owns a car. 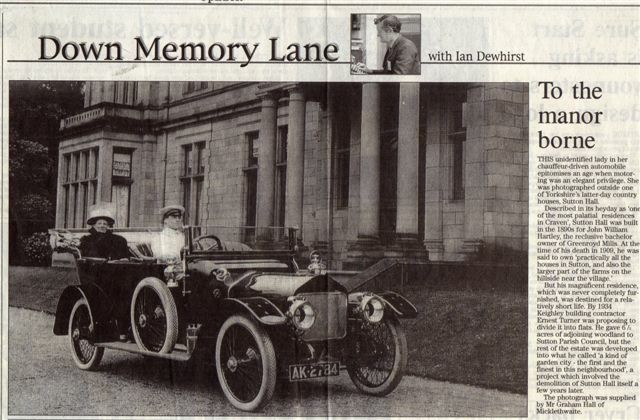 I believe the lady in the car is Emma Hartley, John William Hartley's second cousin who lived with him and inherited the Hall when he died. I have found a newspaper report (transcript below) on the strange condition in his will allowing Emma Hartley to inherit as long as she stayed single. As the article says she successfully applied to the courts to have the condition set aside though she never married and lived at the Hall till her death in December 1930. CURIOUS PROVISION IN WILL OF MILLOWNER. INCOME LOST IF THE LADY MARRIES. Sutton Hall, some two miles from KildwicK Railway Station, was built about sixteen years ago by the late John William Hartley, a local mill owner. In the year 1905 his cousin, Miss Emma Hartley, went to live at the Hall and remained there until his death, three years ago. Mr Hartley was a bachelor, and by his will (says the Yorkshire Evening Post) he left his estate to Miss Hartley, who, however, could only enjoy its possession so long as she remained unmarried and lived at the Hall. Miss Hartley, however, has no great desire to remain in such a large house which ill accords to her simple tastes, she being the daughter of a farmer in the district, and she wishes to sell the house and grounds so that she may take another place more suited to her requirements. In the Chancery Division on Wednesday, therefore, leave to sell was asked, but the application was opposed by a relative of the tenant for life in remainder, and the members of his family. Their case was that Mr John William Hartley clearly intended that the house should be occupied by someone- bearing his name, and that it would not be difficult to let the place. In the end, Mr Justice Warrington gave Miss Hartley leave to sell in the usual manner under the Settled Land Acts. A Yorkshire Evening Post representative visited the village of Sutton yesterday morning, and called at the Hall. Miss Hartley, a lady of engaging presence, and unaffected manners admitted that she longed for a less pretentious residence than that in which she was compelled to live by the terms of her cousin's will. "It had not been all plain sailing with her occupancy since her relative died", and, during the early summer, of this year, when the matter came before the Court in London, the Judge, said Miss Hartley, seemed inclined to grant the order for sale, but asked for some evidence. That had now been given, with the result that the house could be sold. "With the grounds, of course," she was careful to add. Her cousin, (the late Mr John William Hartley), she said, was a cotton spinner in Sutton, in a fairly large way. He did well in business, but was also left a considerable fortune by his father. He was of a very reserved nature, and it was rarely that she saw him except at meals, even though she was living in the house. Not a word was ever said to her either for or against marrying, she concluded, however, that he was against marriage by the fact of his never having been himself married. It was not, consequently, altogether a surprise that he laid down in his will that she should not take a husband. Whether the sum was �2000 or �3000 a year, she would lose it if she married: there was no doubt about that. If the house could not be sold, she supposed she would have to go on living in it.